TH-3 Case Study Cylinder House White 21-inch Plant Pot, Large. Embraced by design aficionados of modern architecture from New York to Los Angeles, Vessel's modern Architectural Pottery Planter Collection remains a favorite of prominent mid-century and modern Los Angeles architects. Featured in several of California's most iconic dream houses such as Richard Neutra, Craig Ellwood and Pierre Koenig; this modernist pot is also featured in Julius Schulman's black & white photography. 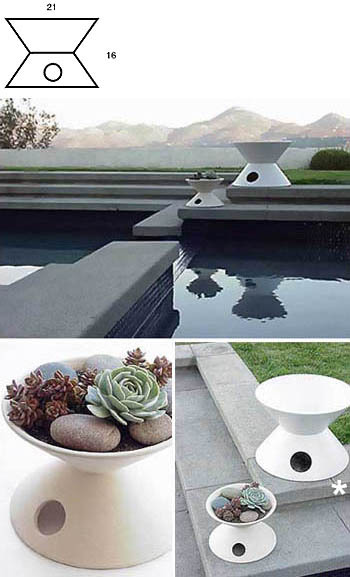 Made by Vessel/Architectural Pottery for NOVA68; a Los Angeles Architecture and design firm specializing in modern residential and commercial planter pot designs in the tradition of John Entenza's famous Case Study House Program.